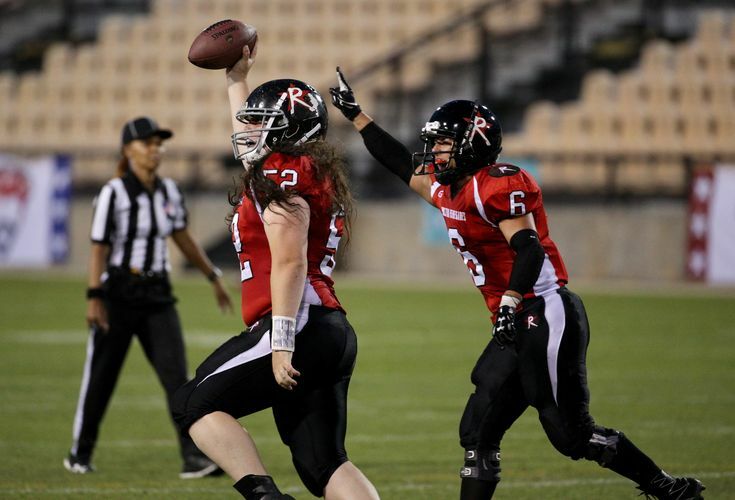 The Boston Renegades notched a 42-18 victory over the Los Angeles Warriors in Saturday night&apos;s Women&apos;s Football Alliance Division I National Championship at Kennesaw State University in Atlanta. And the @GoRenegades are your 2018 @wfafootball Champions! It was the third title for Boston (9-2), which handed LA (11-1) its lone loss of the season. Fifteen-year veteran quarterback Allison Cahill threw a touchdown pass to running back Chante Bonds as Boston took a 7-0 first-quarter lead. The Renegades upped their advantage in the second period when Cahill connected with wide receiver Stephanie Pascual for a score. Cahill made it 21-0 with a 73-yard pass to Bonds for a TD, which followed a fumble recovery by linebacker Allie Genereux (below). Los Angeles broke through before halftime with a big play from defensive lineman Angelique Smith. After a score by Renegades receiver Lauren Yung made it 28-6 in the third quarter, quarterback Chantel Niino-Wiggins threw a TD to wideout Lisa King to cut LA&apos;s deficit to 16. Bonds scored her third touchdown of the game in the fourth quarter on a punt return, and Warriors linebacker Suzanne Linn answered with kick-return TD. Pascual closed it with a 41-yard score, and Boston coach John Johnson got the victory bath.